Welcome to the most interactive cookery on the net with thousands of free recipes and tons of cooking tips! RECIPE TITLE "Brazilian Chicken Rainbow Salad (Salpico de Galinha)"
Cheerfully colorful salads of cooked diced meats and cooked vegetables, often dressed with a thin coating of mayonnaise, are very popular in Latin America, where they are referred to as salpicn, or salpico in Portuguese. This version, from central Brazil, is a particularly attractive combination of chicken, tender corn, beans, apples, raisins, and hearts of palm. The recipe comes from Dora, a cook from Ouro Prto. She suggests using just enough mayonnaise to lightly coat the ingredients without obscuring their taste. 1. To make the salad: Mix the salad ingredients in a large bowl. 2. To make the dressing: In a small bowl whisk together the mayonnaise, lemon juice, and water. 3. Toss the salad with the dressing and season with salt and pepper to taste. 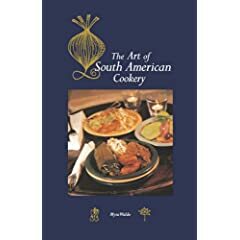 As diverse as its history and as varied as the countries that make up the continent, South American cooking combines the agricultural greatness of the pre-Columbian native peoples--responsible for cultivating the potato, tomato, chile pepper, and corn--with the culinary traditions of later arrivals from Spain, Portugal, the west coast of Africa, Italy, and elsewhere to create a delicious cuisine of dimension and depth.